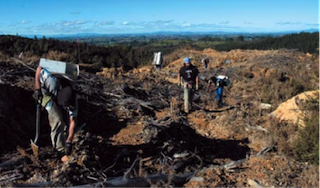 Forestry shake-up as company penalised $35,000 and prevented from hiring migrants - One of central North Island’s largest forestry silviculture companies has been penalised $35,000 at the Employment Relations Authority (ERA) for paying four former migrant employees less than the minimum wage for every hour they worked. Silviculture Solutions Ltd (SSL), an associated company of CNI Forest Management Limited and a supplier of Silviculture services to Timberlands, employs up to 250 staff in forest block growing and maintenance. SSL was determined by the ERA to have used an “illegal system of calculating pay,” and paid the workers only for “productive hours”. “The fours worker received between $241-$4,846 below their minimum wage entitlement, for more than a year. The penalties automatically place SSL on the Immigration Stand Down List, preventing them from hiring migrant workers for 18 months,” says Kevin Finnegan Regional Manager in charge of the Inspectorate’s Forestry strategy. These so-called ‘productive hours’ also excluded travel time in transporting workers in vans through the forest to their work sites, as well as time spent preparing equipment and having required safety briefings. “This notion of ‘productive hours’ is totally unlawful and highly exploitative of workers. The case serves as strong reminder to any contracting business that minimum employment standards in New Zealand, including payment for all hours worked, apply to everyone, including migrant workers,” says Mr Finnegan. The determination was limited to underpayments of the four identified workers, but the ERA also determined SSL’s own accountant identified, by extrapolation, the considerable benefit the company had gained from its illegal pay system, potentially amounting to as much as $300,000 a year across the entire workforce equating to $1.6 owing to workers over a 6 year period. “Fear can dissuade workers from coming forward in these situations. But the Inspectorate encourages anyone who has information about minimum standards not being met to phone the MBIE’s service centre where calls will be handled in a confidential manner, on 0800 20 90 20. “This determination should send a message to the entire Forestry industry that breaches of minimum standards will not be tolerated and that ensuring entire supply chains are operating in a compliant manner is vital to the ongoing viability and reputation of the industry. The potential for investors to withdraw from Forestry because of poor social practises is high, if changes are not made,” Mr Finnegan says. Employers are also encouraged to find out more about their rights and obligations on the Employment New Zealand website here.